This is a case lot of 500 rounds of 55 grain FMJ ammunition by Hornady for the .223 Remington cartridge. 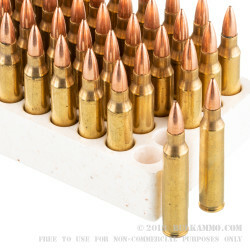 Premium ammunition from a premium producer for a gun that has its choice of premium ammunition to choose from. This is a great precision target load, without the premium pricing of true match ammo. 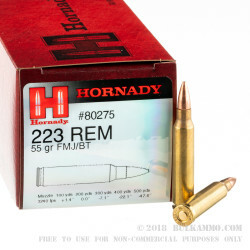 The reputation and reliability of the Hornady line of .223 ammunition makes this an obvious choice for those who want a load that is a definitive step up from traditional bulk buys, and yet, does not cost so much that it is hard to justify more than 20-40 rounds at a time. This is a great middle ground between the plinking type ammunition so common to the marketplace and the match grade stuff that costs double the price or more. The 55 grain full metal jacket projectile is a boat tail design and the clean powder mix offers great power and minimal headache in clean-up. 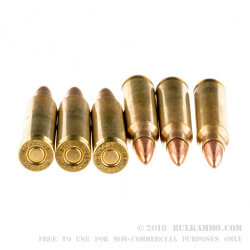 The Boxer primed brass casing is a great value add to the line because Hornady brass is always excellent and the price point is still relatively low. Reloaders will appreciate the brass quality. All shooters will appreciate the 1.5 MOA or better accuracy out of the barrel. 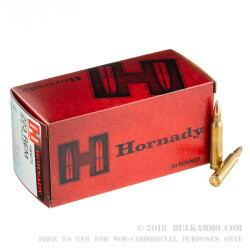 A: The muzzle velocity of this Hornady 55gr FMJBT ammo is 3240fps.